From Middle English pancake, equivalent to pan +‎ cake. The juggling sense is by analogy with a pancake being tossed in a pan. Compare Saterland Frisian Ponkouke, Ponkuuke (“pancake”), West Frisian pankoek (“pancake”), Dutch pannenkoek (“pancake”), German Low German Pannkook (“pancake”), German Pfannkuchen (“pancake”). A thin batter cake fried in a pan or on a griddle in oil or butter. (theater) A kind of makeup, consisting of a thick layer of a compressed powder. (juggling) A type of throw, usually with a ring where the prop is thrown in such a way that it rotates round an axis of the diameter of the prop. have been working on pancake throws with rings for the past few months and I have been trying to make the throws perfectly spun and as consistent as possible. Anything very thin and flat. 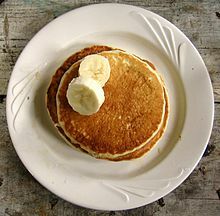 (intransitive) To make a pancake landing. (construction, demolition) To collapse one floor after another. From panne (“pan”) +‎ cake. “panne-cāke (n.)” in MED Online , Ann Arbor, Mich.: University of Michigan, 2007, retrieved 2018-07-05.